The first semi final on Day 2 at the Women’s Basketball Championships in Porirua featured ProBands Nelson Sparks and Auckland Counties Manukau Lady Hawks. The Hawks enjoyed the better of the early exchanges opening up a 16-12 first quarter lead. Nelson point guard Jodi Hikuroa-Jeffrey knocked down a couple of threes and controlled the tempo in the second period to give the Sparks a slender 26-24 half-time advantage. The Hawks opened the second half with a 10-3 run and dominated the third period to forge ahead 44-29 thanks in part to Shanice Swain’s (15pts) three triples in the period. The Tony Rampton coached Sparks were not going to go down without a fight and responded early in the final period to reduce the deficit to single digits. The Hawks looked to have weathered the storm but a Kat Jones (10pts/11rebs) triple with three minutes remaining cut the Hawks lead to 54-51. Hikuroa-Jeffrey (17pts) had an opportunity to tie the game with 20 seconds remaining but saw her effort rim out leaving Jordan Hunter to ice the game from the free throw line for the Hawks. Jess Bygate (9pts/9 rebs) kept Nelson competitive in the paint enjoying a tremendous battle with Kalani Purcell who led all scorers with 17 points and also garnered 10 boards. The second semi-final featured the two teams with the best regular season records in the WBC this year. Oceana Gold Rush Otago were quick out the traps against Waikato Wizards opening an early double figure lead before a late Leanne Walker triple kept Waikato close, trailing 24-18 at quarter time. Back to back threes from Parai Kyle-Renee (11pts) midway through the second period brought Waikato within two points and a long three from Bayley Ross-Watai (13pts) gave the Wizards a 35-32 advantage. This was cancelled out by Samara Gallaher to give Otago the narrowest of half time leads, 36-35. Otago were still in the ascendancy 52-48 with 10 minutes remaining. The final quarter was remarkable for the wrong reasons for the Wildcats. A Jess Take put back on the final buzzer was their only field goal in the quarter as the normally reliable Waikato shooting completely dried up. The opening Plate semi-final was an all Auckland affair with Harbour Breeze taking on Waitakere Lady Rangers. 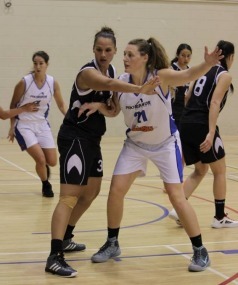 The Breeze led 41-28 at half-time before easing to an 80-62 victory. Millie Nathan (16pts) and Anna Lacey (14pts) led the Harbour offence with a dozen points from Katelin Noyer and a game high 18 points from Moengaroa Subritzky the best for Waitakere. There were two games played to decide the minor placings (9-12).